This procedure describes how to set service level agreement CPU features. 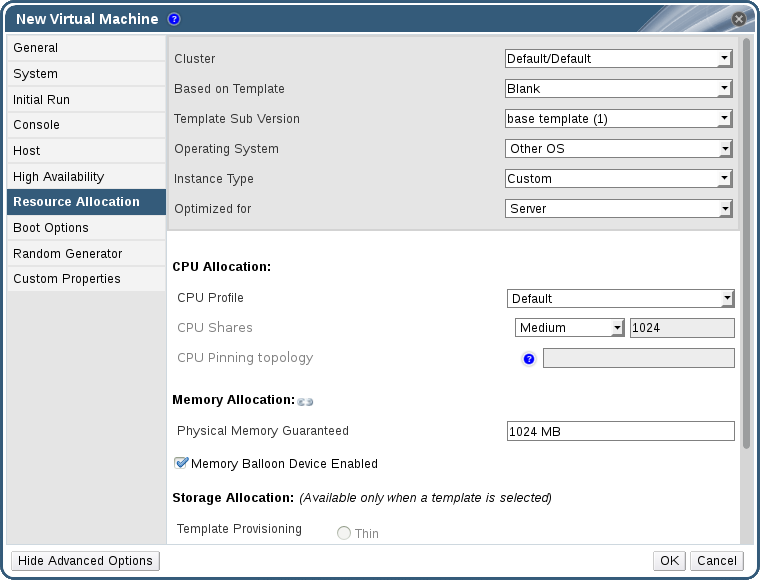 Select New VM in the Navigation Pane. Select the Resource Allocation tab. Specify CPU Shares. Possible options are Low, Medium, High, Custom, and Disabled. Virtual machines set to High receive twice as many shares as Medium, and virtual machines set to Medium receive twice as many shares as virtual machines set to Low. Disabled instructs VDSM to use an older algorithm for determining share dispensation; usually the number of shares dispensed under these conditions is 1020. You have set a service level agreement CPU policy. The CPU consumption of users is now governed by the policy you have set.